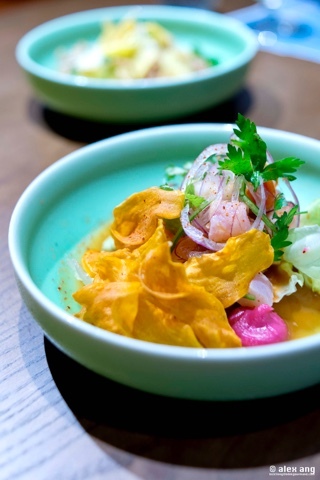 If you know Daniel Chavez, the Peruvian chef-owner of five-year-old Spanish eatery, Ola Cocina Del Mar (“Ola”), you would know that his new cevicheria offshoot, Tono, is a long time coming. From the one-off Peruvian night he has hosted at Ola to the semi-permanent Peruvian highlights of tiradito and ceviche that have dotted the restaurant’s Spanish menu, diners could see the writing on the wall but it wasn’t until late last year that Chavez announced his decision to open his new digs at DUO to officially showcase what is now known as the national dish of Peru. Dressed in vibrant colours with a turquoise dancing fish for logo proudly stencilled on its floor-to-ceiling glass window and fish scales for design on parts of the floor and on the bar stand, you know the Peruvian party culture is on full display at the 66-seat Tono and it has a name, meaning party in the Peruvian slang, as proof. But the party would be in vain if not over good food and drinks and we are happy to report that Tono passes mostly with flying colours, thanks in no small part to the Latin American-staffed kitchen headed by executive chef, Mario Malvaez, a native of Mexico who spent three months learning his ropes in Peru. 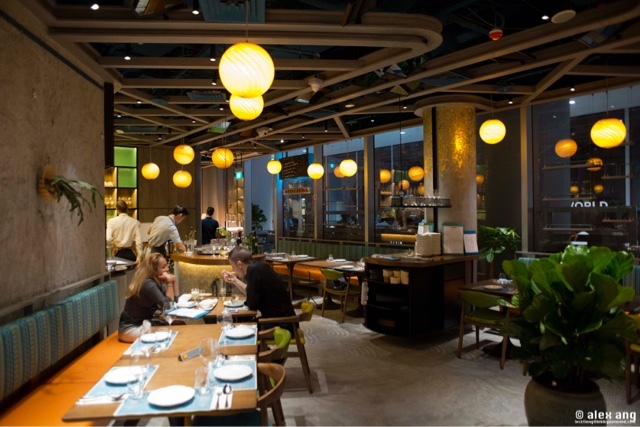 Ceviche prepared a la minute is Tono’s raison d’être and the menu offers multiple options for the curious Singapore diner. The most basic option is Classico (S$25), a toss of fish of the day, either New Zealand red snapper or trevally, in lime juice with sliced chilli, served alongside puddles of sweet potato puree and toasted corn kernels. If you have an appetite for more vibrant flavours, Mixto is your ticket – blanched seafood (prawn, calamari, octopus) enrobed in a heady tiger’s milk concoction of lime juice and Peruvian rocoto chilli (Andean chilli pepper, known to be one of Peru’s spiciest), with onions and plantain chips. 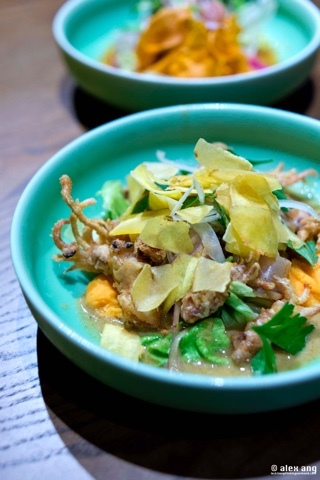 There is also a Tono (S$28) offering of lime juice-cured fish-of-the-day with deep-fried baby calamari, orange sweet potato puree and fried plantain chips in a decidedly more savoury tiger’s milk dressing flavoured with charred garlic, celery and ginger. All three offerings are well made with the lime juice providing a lovely zing and surprisingly, none stands out for being too spicy, not even my favourite ceviche of Mixto. 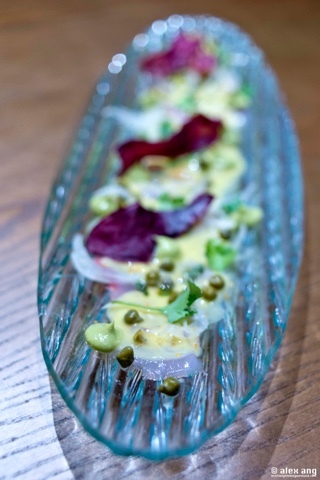 While fish is usually cubed for ceviche, the same fish is given the sashimi cut for tiradito, a dish that reflects the influence of Japanese immigrants on Peruvian cuisine. And given that the Italians were the second largest group of Europeans to settle in Peru, it makes sense that Mediterranean flavours found their way into Peruvian cuisine too. A dish representative of these Japanese and Mediterranean influences is Guapo (S$24) – fish of the day cured in tiger’s milk with generous servings of capers, avocado puree, salsa criolla (pickled sliced onions with aromatics and chilli pepper) and twirls of sweet potato chips. Even with the other ingredients and flavours coming into play with the tiger’s milk, the pristine flavour of the fish still manages to come to the fore. Compliments to the fish, but also to the chef for the mastery. Causa, which refers to the Peruvian mashed potato salad with mayonnaise, may not have the fame nor the status of its revered cured fish sibling but it’s no pushover. Not if it has all the trappings of Tono’s Solterito (S$24), a mound of lime and aji amarillo-seasoned mashed potato dressed in a house-made mayonnaise infused with black olives and tomatoes for a dose of umami. 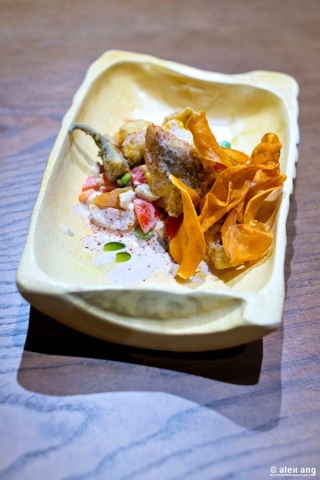 The dish has several background casts but be it the deep-fried red snapper, cherry tomatoes, sweet potatoes, fava beans or feta cheese, they all play in harmony to the strength of the dish. All zing and no savoury makes Tono a dull boy, which is why most diners will appreciate the offerings on the Piqueos (small light first courses) menu, the only non-seafood offering of which is Anticuchos (S$22/S$25). 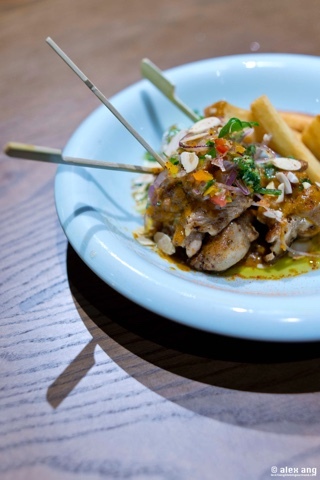 Meaning small pieces of grilled skewered meats that originated in the Andes, chicken marinated in panca chilli, red wine vinegar and oregano is skewered, cooked a la plancha and served with cassava and sliced almonds in a sauce made of chalaquita essentially chopped peppers, onions, and cilantro, tomatoes and white tiger’s milk. While this is by no means fodder for favourite dish of the night, it provides a pleasant savoury break from the zing-happy meal. Also on the same menu, Jalea (S$32) pales in comparison, mostly because the seafood of prawns and calamari are completely deep-fried, notwithstanding lovely condiments of smoked chilli mayo, tapioca chips and salsa criolla. For mains, Ola regulars may find some items familiar, not least the Lomo Saltado (S$40), a Chifa-influenced stir-fried dish of beef with tomatoes, onions, coriander and crispy potatoes, that has made appearances at Chavez’s Spanish restaurant. Or try Sudado De Pescado (S$34), a riff of a similar fish stew dish that has been a mainstay at Ola. 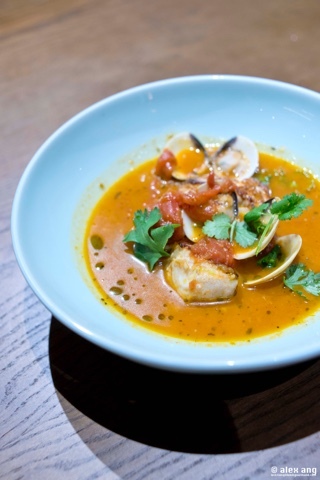 Prepped with pan-seared fish snapper, aji amarillo and aji panca, onions, clams, tomatoes and Peruvian corn cider, the fish stew is hearty and at the same time delicious. You might have noticed that the prices of mains veer a little towards the high side but with Chavez at the helm, you are assured of quality. 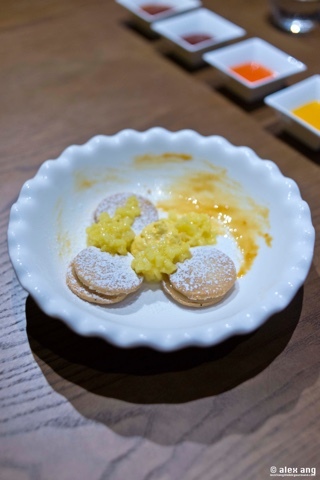 You would rarely find me touting desserts but I would make an exception for Alfajores (S$12), an assortment of homemade butter cookies sandwiched with a layer of dulce de leche filling and mango mousse. So buttery and crisp that it melts in the mouth.